Today’s applications are required to be highly responsive and always online. To achieve low latency and high availability, instances of these applications need to be deployed in datacenters that are close to their users. Applications need to respond in real time to large changes in usage at peak hours, store ever increasing volumes of data, and make this data available to users in milliseconds. 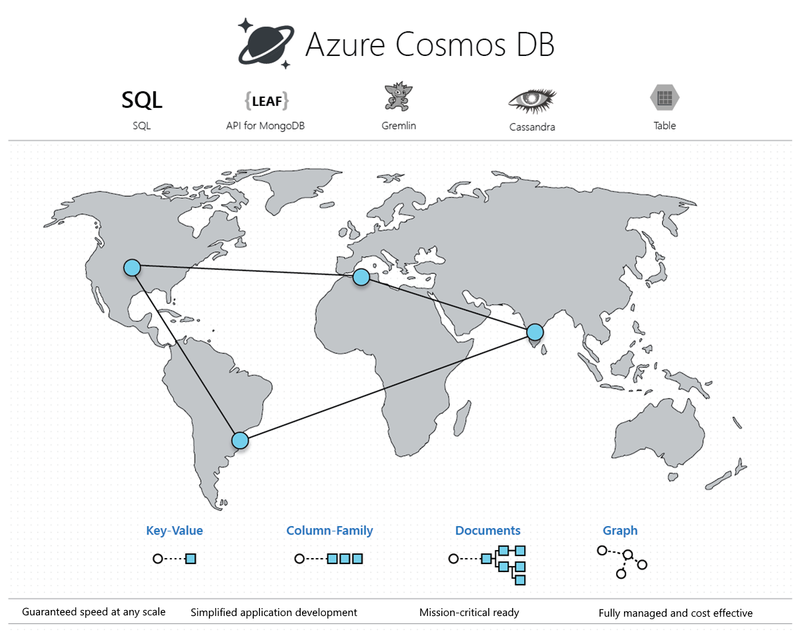 Azure Cosmos DB is Microsoft's globally distributed, multi-model database service. With a click of a button, Cosmos DB enables you to elastically and independently scale throughput and storage across any number of Azure regions worldwide. You can elastically scale throughput and storage, and take advantage of fast, single-digit-millisecond data access using your favorite API including SQL, MongoDB, Cassandra, Tables, or Gremlin. Cosmos DB provides comprehensive service level agreements (SLAs) for throughput, latency, availability, and consistency guarantees, something no other database service offers. You can Try Azure Cosmos DB for Free without an Azure subscription, free of charge and commitments. Cosmos DB enables you to build highly responsive and highly available applications worldwide. Cosmos DB transparently replicates your data wherever your users are, so your users can interact with a replica of the data that is closest to them. Cosmos DB allows you to add or remove any of the Azure regions to your Cosmos account at any time, with a click of a button. Cosmos DB will seamlessly replicate your data to all the regions associated with your Cosmos account while your application continues to be highly available, thanks to the multi-homing capabilities of the service. For more information, see the global distribution article. By virtue of deep integration with Azure infrastructure and transparent multi-master replication, Cosmos DB provides 99.999% high availability for both reads and writes. Cosmos DB also provides you with the ability to programmatically (or via Portal) invoke the regional failover of your Cosmos account. This capability helps ensure that your application is designed to failover in the case of regional disaster. Designed with transparent horizontal partitioning and multi-master replication, Cosmos DB offers unprecedented elastic scalability for your writes and reads, all around the globe. You can elastically scale up from thousands to hundreds of millions of requests/sec around the globe, with a single API call and pay only for the throughput (and storage) you need. This capability helps you to deal with unexpected spikes in your workloads without having to over-provision for the peak. For more information, see partitioning in Cosmos DB, provisioned throughput on containers and databases, and scaling provisioned throughput globally. Using Cosmos DB, you can build highly responsive, planet scale applications. With its novel multi-master replication protocol and latch-free and write-optimized database engine, Cosmos DB guarantees less than 10-ms latencies for both, reads and (indexed) writes at the 99th percentile, all around the world. This capability enables sustained ingestion of data and blazing-fast queries for highly responsive apps. When building globally distributed applications in Cosmos DB, you no longer have to make extreme tradeoffs between consistency, availability, latency, and throughput. Cosmos DB’s multi-master replication protocol is carefully designed to offer five well-defined consistency choices - strong, bounded staleness, session, consistent prefix, and eventual — for an intuitive programming model with low latency and high availability for your globally distributed application. Keeping database schema and indexes in-sync with an application’s schema is especially painful for globally distributed apps. With Cosmos DB, you do not need to deal with schema or index management. The database engine is fully schema-agnostic. Since no schema and index management is required, you also don’t have to worry about application downtime while migrating schemas. Cosmos DB automatically indexes all data and serves queries fast. Cosmos DB is a foundational service in Azure. For nearly a decade, Cosmos DB has been used by many of Microsoft’s products for mission critical applications at global scale, including Skype, Xbox, Office 365, Azure, and many others. Today, Cosmos DB is one of the fastest growing services on Azure, used by many external customers and mission-critical applications that require elastic scale, turnkey global distribution, multi-master replication for low latency and high availability of both reads and writes. Cosmos DB is available in all Azure regions worldwide, including 54+ regions in public cloud, Azure China 21Vianet, Azure Germany, Azure Government, and Azure Government for Department of Defense (DoD). See Cosmos DB’s regional presence. Since Cosmos DB is a fully managed service, you no longer need to manage and operate complex multi datacenter deployments and upgrades of your database software, pay for the support, licensing, or operations or have to provision your database for the peak workload. For more information, see Optimize cost with Cosmos DB. Cosmos DB is the first and only service to offer industry-leading comprehensive SLAs encompassing 99.999% high availability, read and write latency at the 99th percentile, guaranteed throughput, and consistency. You can run Spark directly on data stored in Cosmos DB. This capability allows you to do low-latency, operational analytics at global scale without impacting transactional workloads operating directly against Cosmos DB. For more information, see Globally distributed operational analytics. Easily migrate your application to Cosmos DB while preserving significant portions of your application logic. Keep your application portable and continue to remain cloud vendor-agnostic. Get a fully-managed cloud service with industry leading, financially backed SLAs for the common NoSQL APIs. Elastically scale the provisioned throughput and storage for your databases based on your need and pay only for the throughput and storage you need. This leads to significant cost savings. Any web, mobile, gaming, and IoT application that needs to handle massive amounts of data, reads, and writes at a global scale with near-real response times for a variety of data will benefit from Cosmos DB's guaranteed high availability, high throughput, low latency, and tunable consistency. Learn about how Azure Cosmos DB can be used to build IoT and telematics, retail and marketing, gaming and web and mobile applications. Read more about Cosmos DB's core concepts turnkey global distribution and partitioning and provisioned throughput.